Earned aboard HMS REVENGE or HMS PHOENIX! 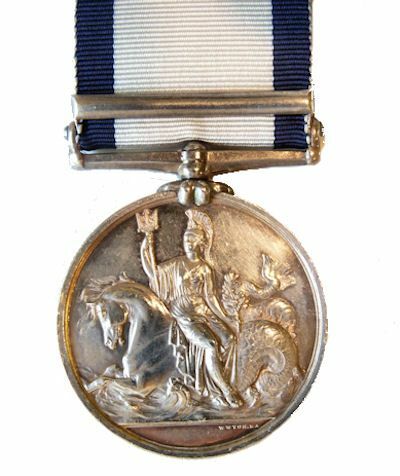 Presented is a very rare example of the British Naval General Service Medal (NGSM) with the SYRIA CLASP of which only 675 were known to have been issued. It is in extremely fine condition. This makes this one of the rarest of medals of this type. The Second Syrian War is the name given to the short war of 1839-40 fought in the Middle East on territory that is now Lebanon. An unusual alliance between the United Kingdom, the Austrian Empire, and others to thwart the expansionist designs of Muhammad Ali of Egypt, who was supported by Spain and to a lesser extent the July Monarchy France. AWARD: This medal was awarded to a George Scott of which there are two listed on page 380 of the book, "The Naval General Service Roll 1793-1840" as recipients. One served as an able bodied seaman in HMS REVENGE and the other was a quartermaster in HMS PHOENIX. The medal is complete with its white ribbon with with blue boarders. This HMS Revenge was the ninth of thirteen ships of this name in the Royal Navy. She was a third rate ship armed with 74 guns and of 1954 tons. She was launched in 1805 and served until 1849. Revenge was actively engaged in the Syrian War of 1840 from its inception, and was involved in all the major sea battles of that war. HMS PHOENIX was a 6-gun steam paddle vessel of the Royal Navy, built in a dry dock at Chatham in 1832. She was reclassified as a second-class paddle sloop before being rebuilt as a 10-gun screw sloop in 1844-45. She was fitted as an Arctic store ship in 1851 and sold for breaking in 1864. From 1 March 1840, under Commander Robert Fanshawe Stopford. 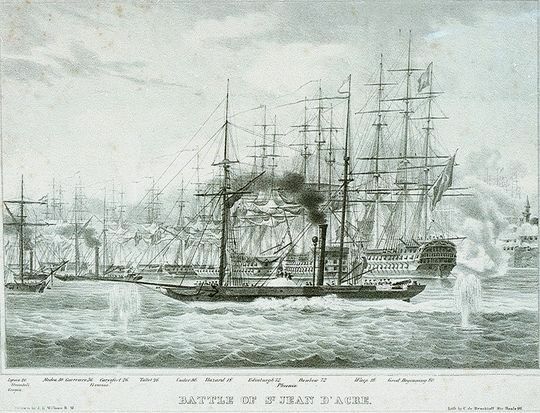 Stopford was in command when she took part in the Bombardment of Acre on 3 November 1840. Subsequently she was commanded from 26 December 1840 by Commander John Richardson until she paid off on 1 January 1842. 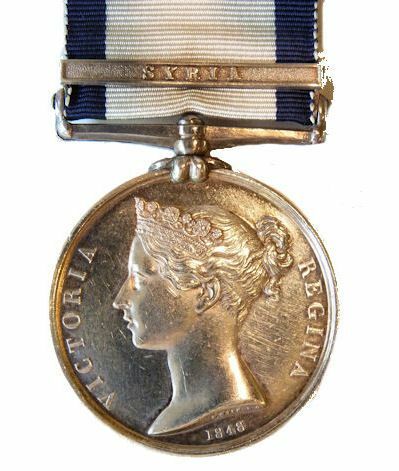 MEDAL'S DESCRIPTION: The Naval General Service Medal was approved in 1847 for issue to officers and men of the Royal Navy retroactively. The obverse has a portrait of Queen Victoria who was not the reigning monarch during any of this period. The reverse has the symbol of Britannia holding a trident astride a seahorse with a fish tail. It was awarded for service in various naval actions from 1793 to 1840, many years after the event. This period included the French Revolutionary Wars, the Napoleonic Wars and the American English War of 1812. Each of the 231 actions were represented by a clasp which, in the case of Guadeloupe, is for its capture on 6 February 1810. See more in MEDAL'S DESCRIPTION continued (below). SPECIFICATIONS: Silver disk 36mm in diameter with clasp and white ribbon with blue edges 32mm in length. The ribbon suspender swivels. MARKINGS: GEORGE SCOTT on edge. W.Wyon, RA (Royal Academy) on the obverse and reverse in very small bas relief under the seahorses tail. CONDITION: The name is officially impressed. This medal is as near to scratch free as imaginable. The detail is of near mint quality with crisp details and high relief, rates it as extremely fine. It carries it ribbon which is also in exceptional condition. THE SECOND SYRIAN WAR OF 1840: The Second Egyptian–Ottoman War or Second Turko–Egyptian War lasted from 1839 until 1841 and was fought mainly in Syria, whence it is sometimes referred as the (Second) Syrian War. MEDAL'S DESCRIPTION Continued:The medal covered a variety of types of actions, from ship to ship skirmishes all the way to major fleet battles. The medal was never issued without a clasp. It was only awarded to surviving veterans who were alive in 1847 and had applied. Because of poor communication and lack of reading ability, most of those eligible failed to apply. Consequently, only 20,933 medals were issued, most with a single clasp. This is far less then the number of men who served in the action and accounts for the limited supply. The final date for submitting applications was May 1, 1851. None were awarded posthumously unless applied for before death. This medal and the Army equivalent were the first British campaign medals.